Safety and style are not mutually exclusive. TCX has built on the popular style of the X-Street shoes and made a taller more protective riding shoe with the TCX X-Rap. The fashionable and functional X-Rap shoes will complement the protection of kevlar jeans on the bike while still looking good off the bike. 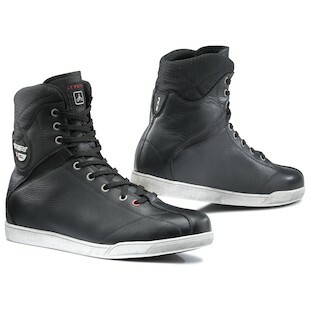 Fashionista urban motorcyclists will dig the high top classic sneaker style with the full-grain leather construction. The reinforced ankle, tie, and heel combine to give this boot CE certification. Whatever shade of kevlar jeans you rock, there will be an X-Rap color that will complete your casual motorcycle ensemble. The X Rap is available in Black, Anthracite/Grey, and Brown/Grey. Need a little bit more customization to your style? The Brown/Grey option includes an extra pair of fluorescent green laces to give your kicks that extra pop. The TCX Women’s X-Rap version offers an Anthracite Grey/Fuschsia colorway. Chuck Taylors were not made to go faster than you can sprint on your own two legs. Keep them off of two wheels (bicycles are ok, hipster). Wear the TCX X-Rap when you want protection without sacrificing style.